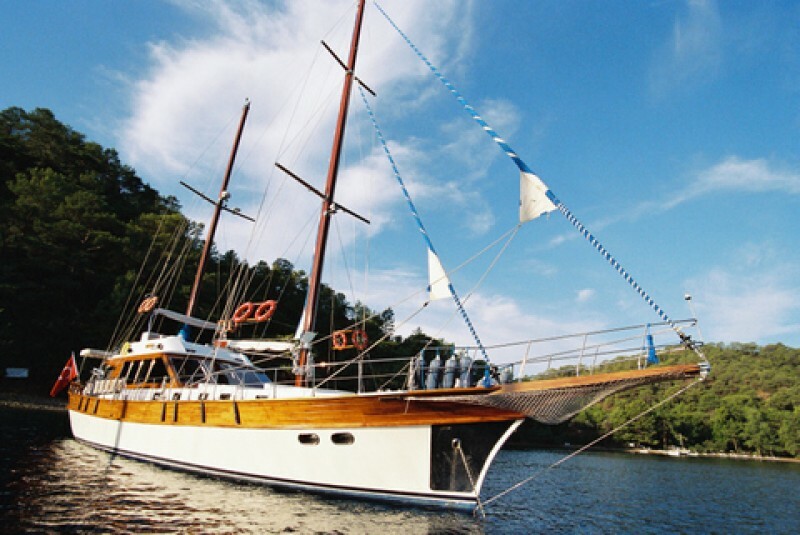 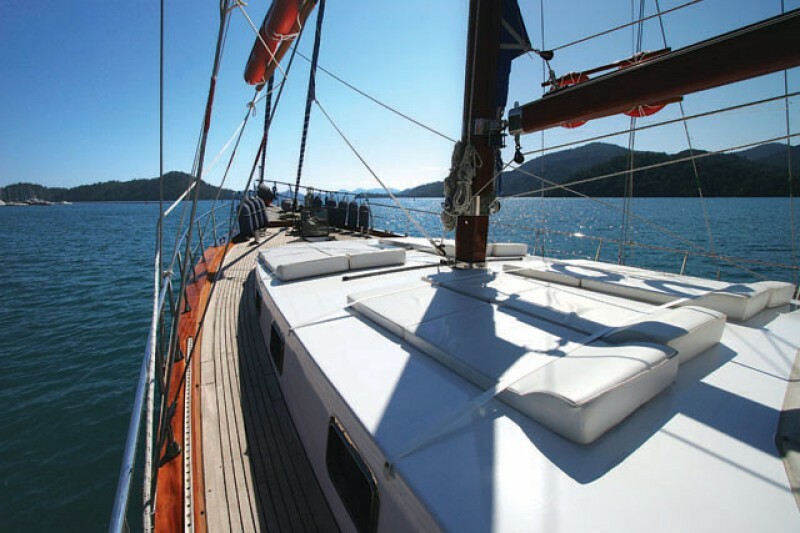 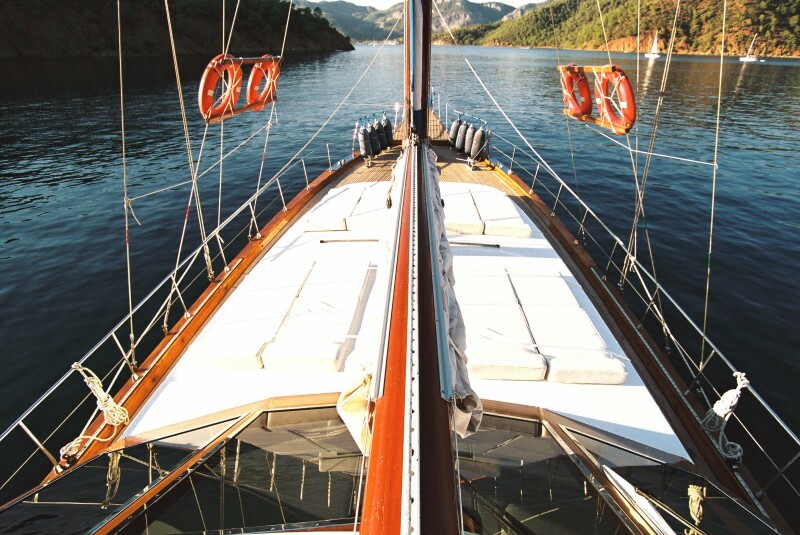 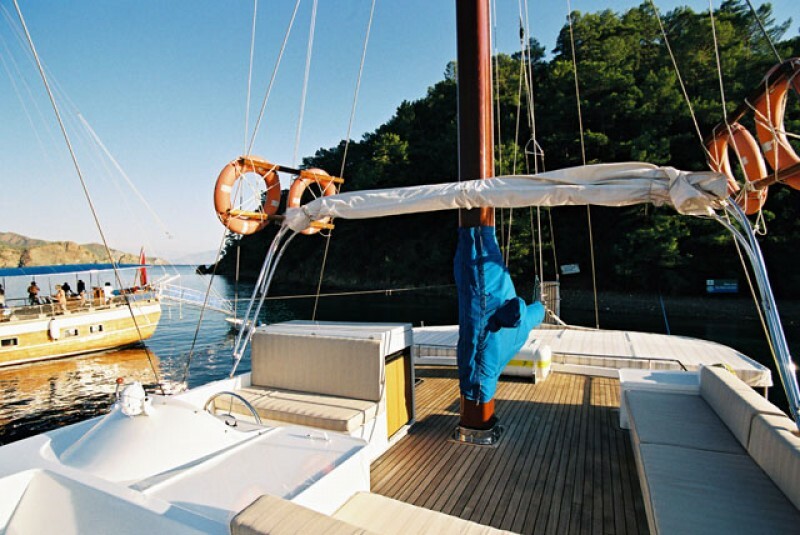 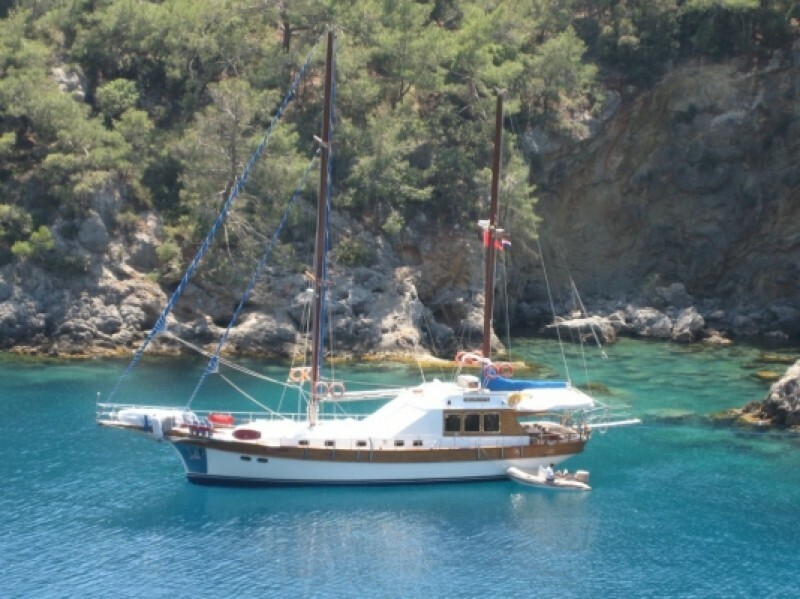 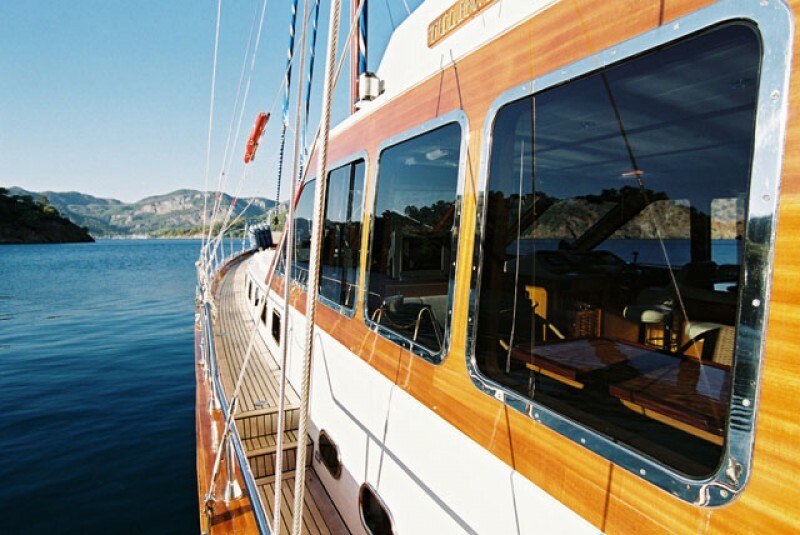 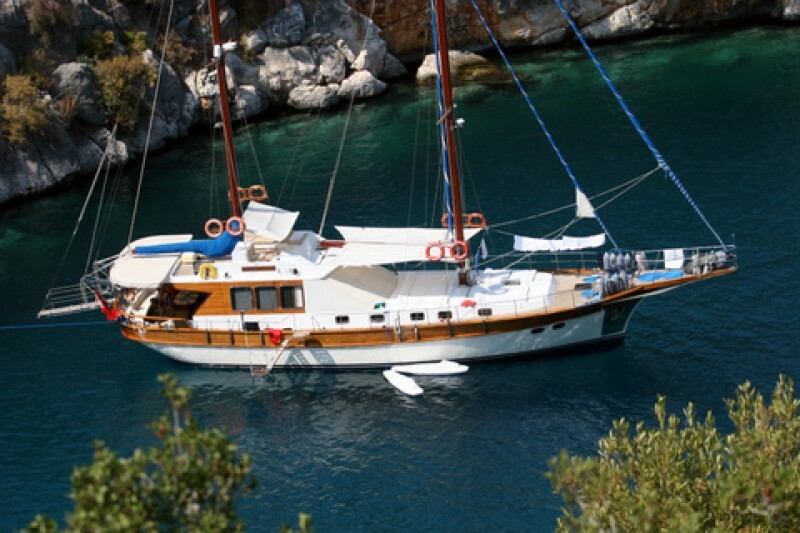 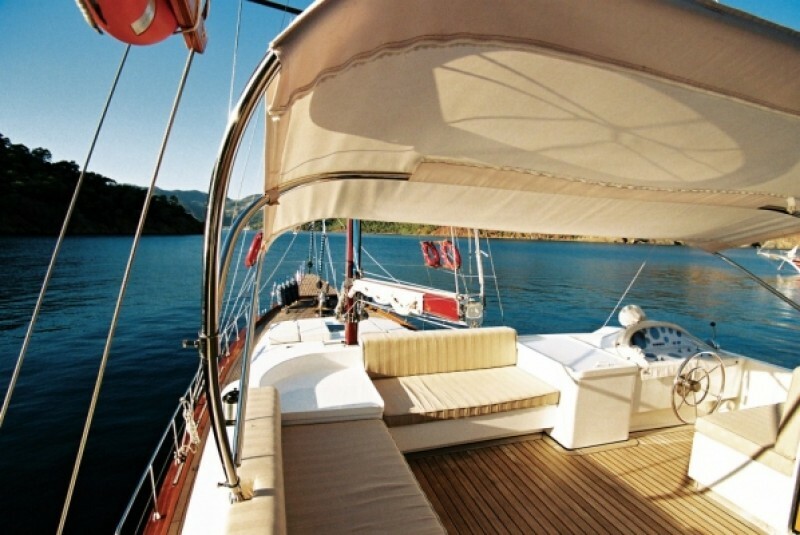 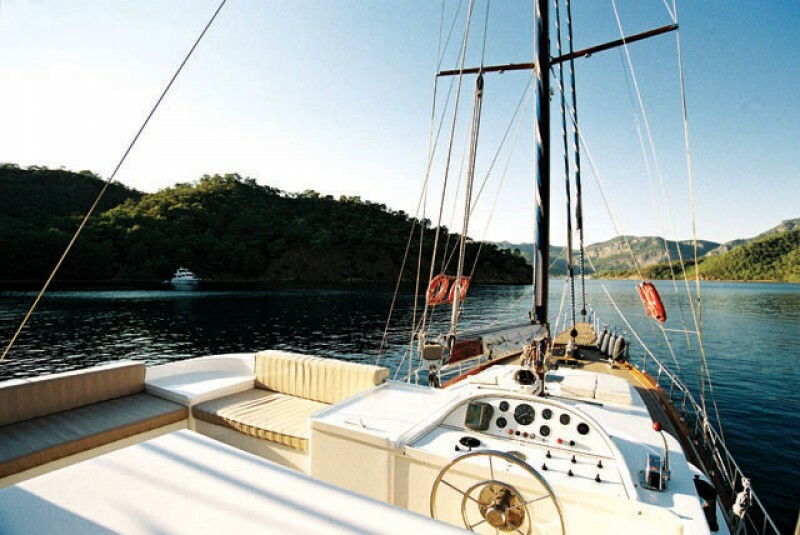 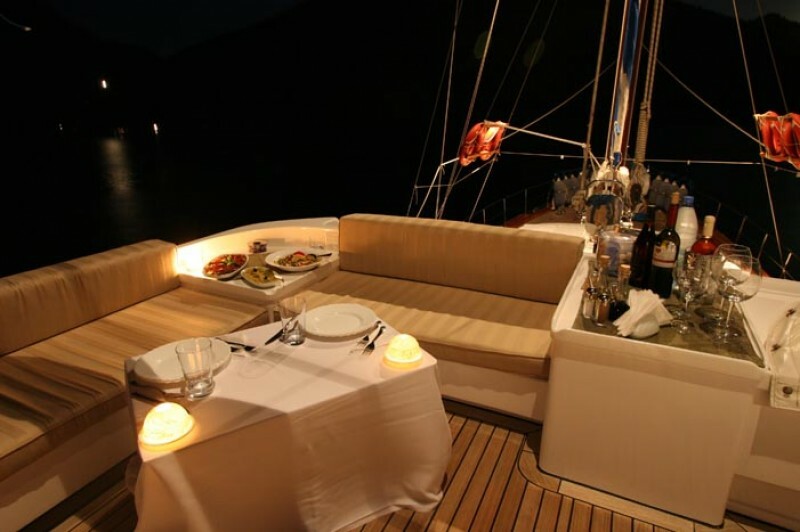 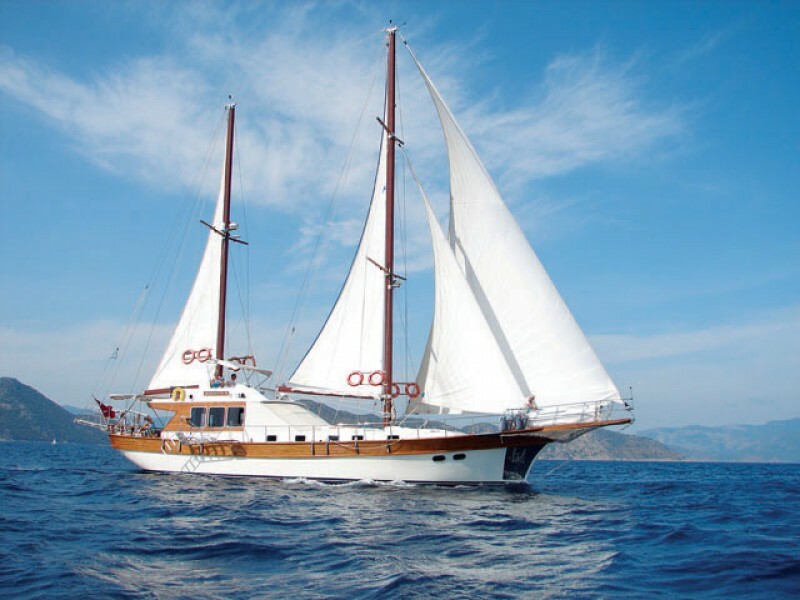 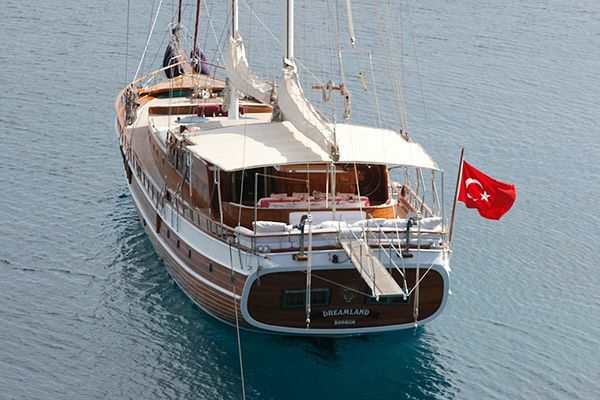 The serene features of the Luxury gulet Serenity 70 make it a perfect choice for a romantic getaway cruise. 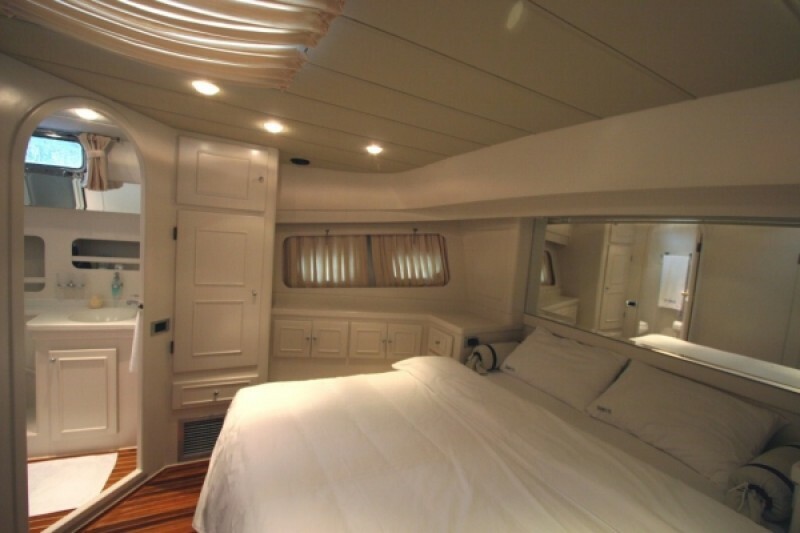 A neat 21 meters hull carries three very comfortable and attractive all white cabins, one being the large luxury master cabin with a central queen size bed, while the other two compact double cabins are to each side. 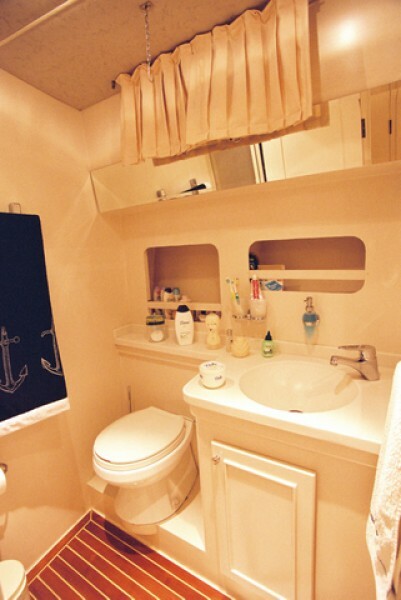 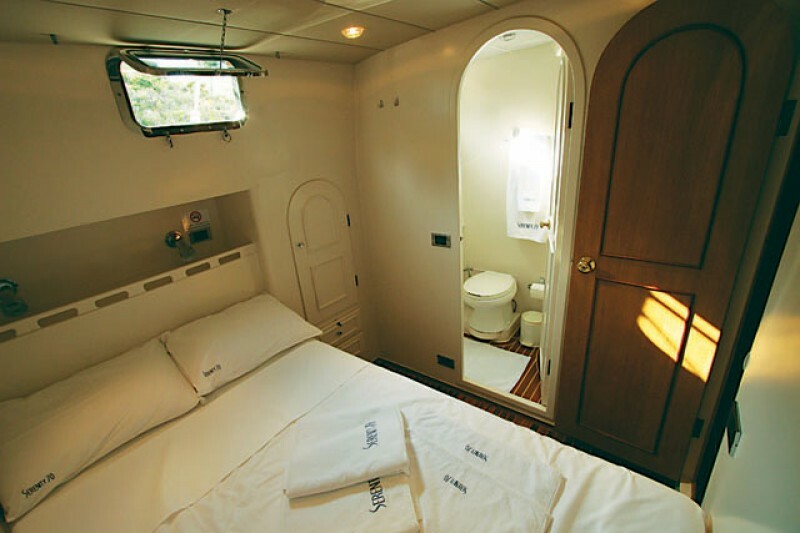 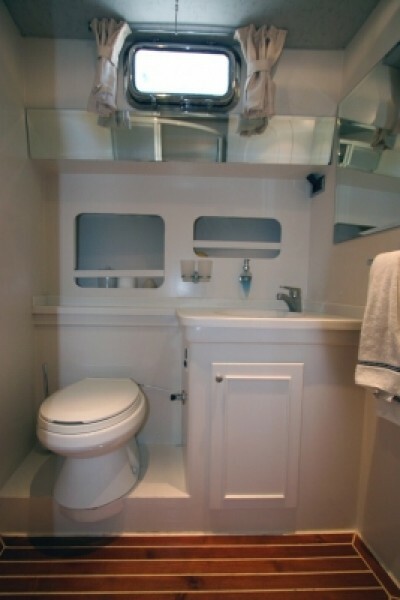 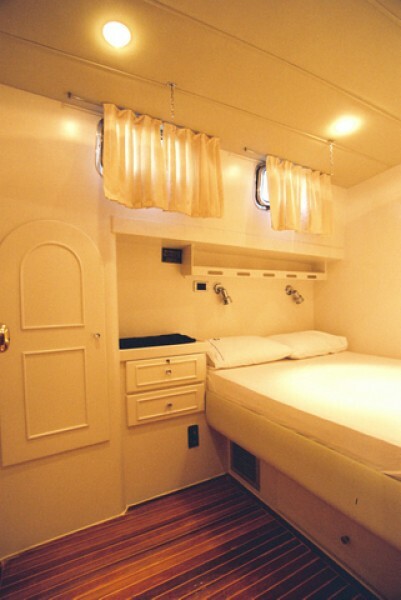 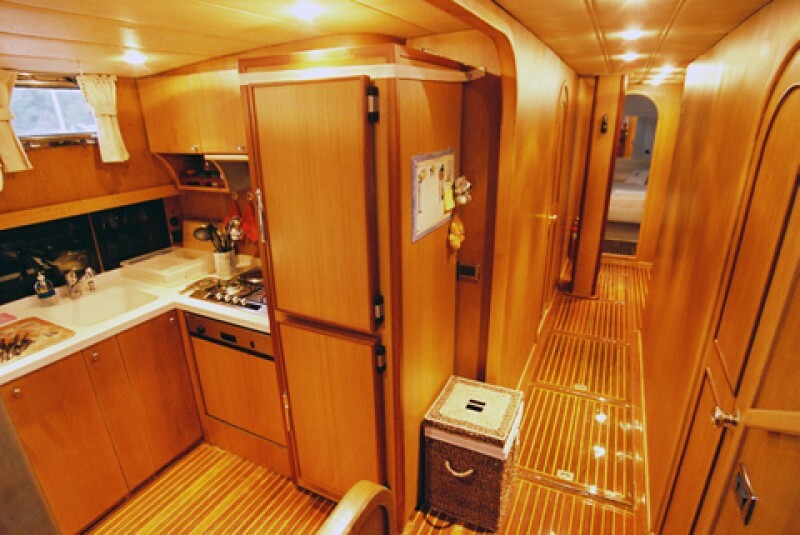 All cabins have private shower rooms and WC and all have air conditioning available. 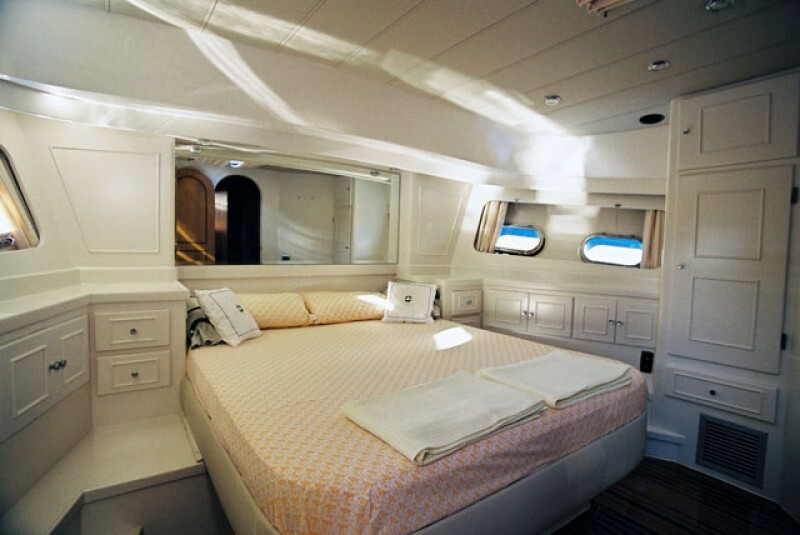 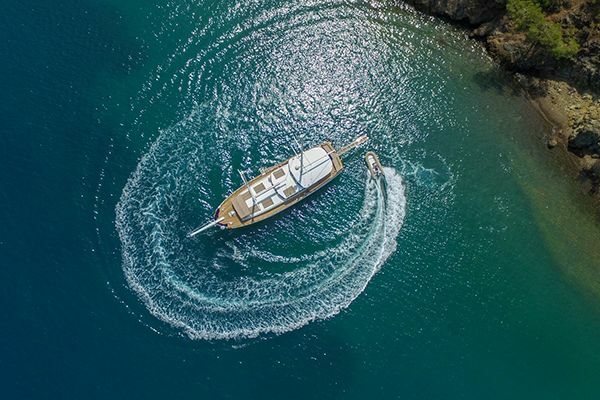 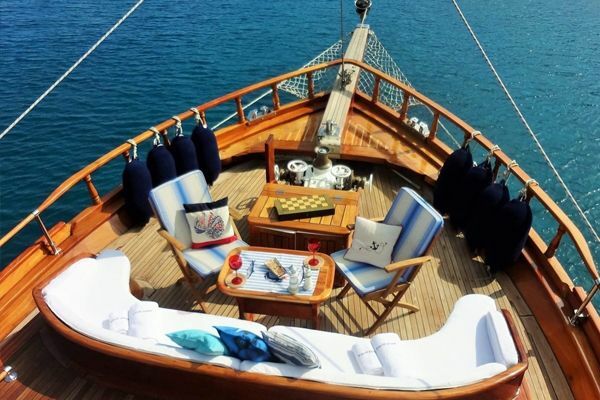 The deck space on Turkish yacht Serenity 70 is exceptionally generous with a gulet of this size as the yacht designers have added a fly bridge: an upper deck where the Captain helms and where there is also space for seating to admire the panoramic view or enjoy the stars. 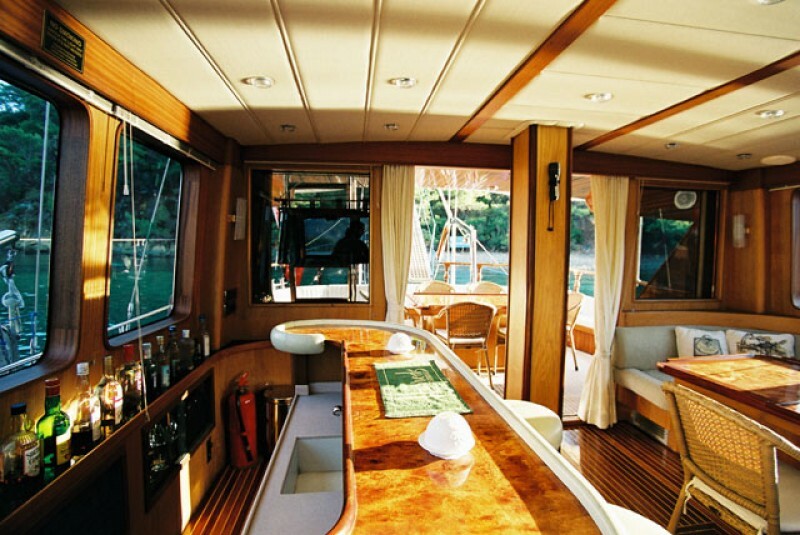 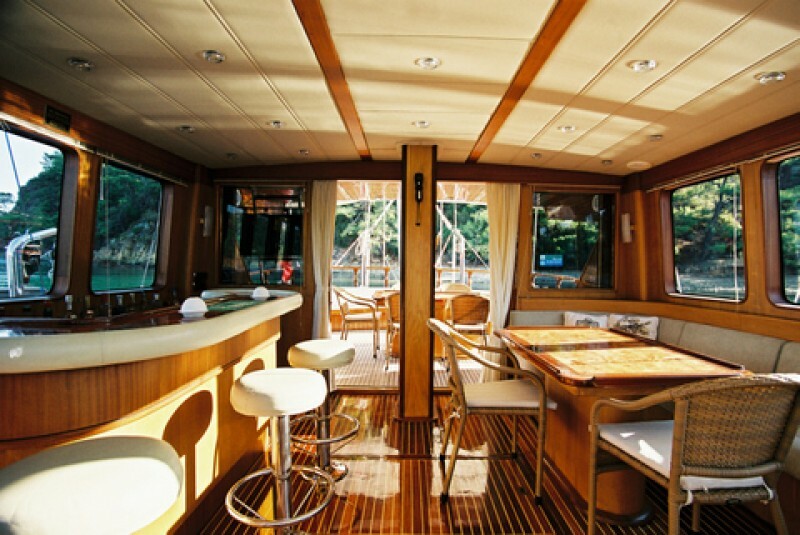 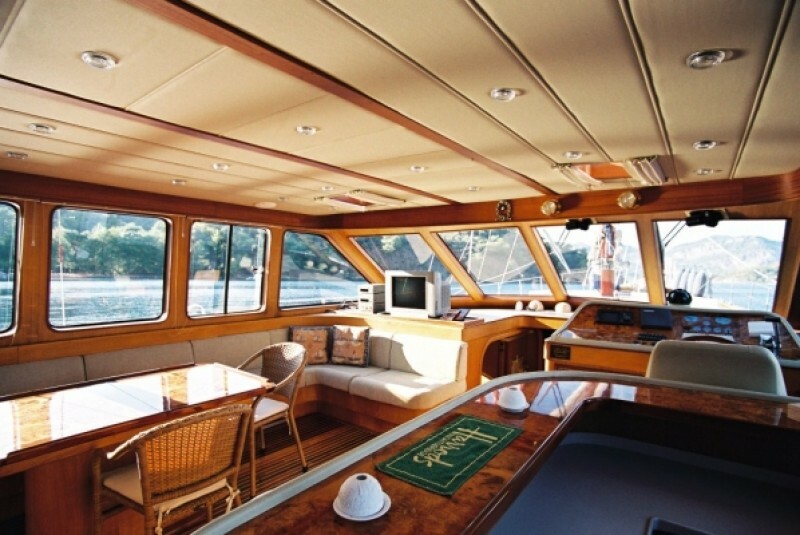 On the main deck the indoor saloon is level with the aft deck, allowing the light of the large windows and the full length glass doors to create a comfortable relaxation area with the TV and DVD library, board games or indoor dining. 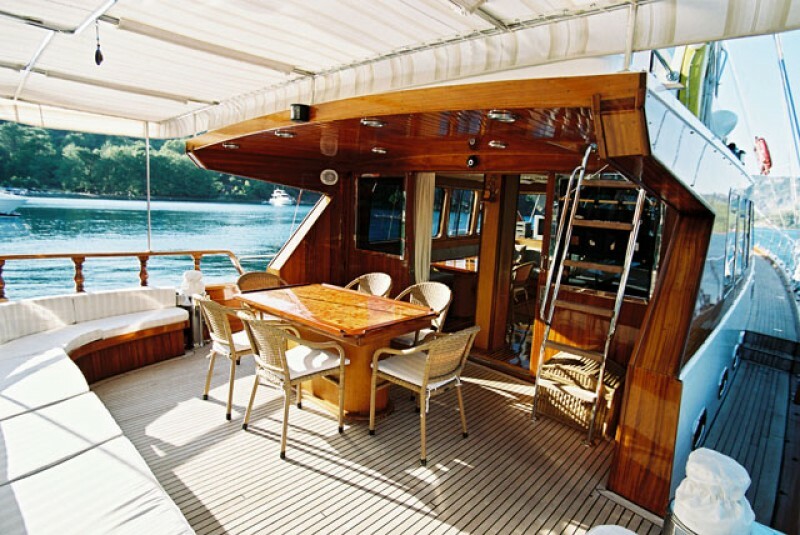 Stepping out on the same level onto the aft deck affords a feeling of more space around the outdoor mahogany dining table and on the stern cushion bank all shaded by an extension of the bridge roof. 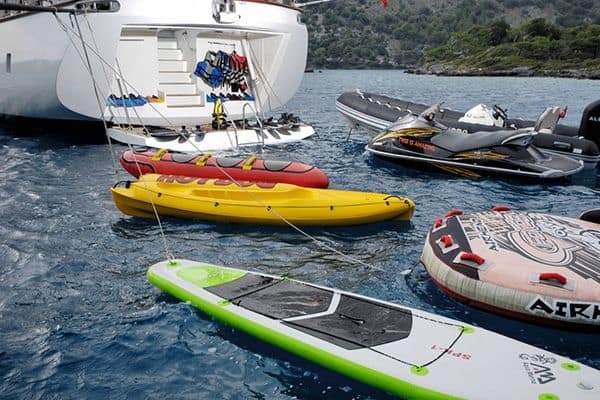 Up forward on the foredeck there are more sunbeds and cushions to enjoy in sun or shade as preferred, if not taking advantage of the well-stocked choice of water toys of water skis, or canoes. 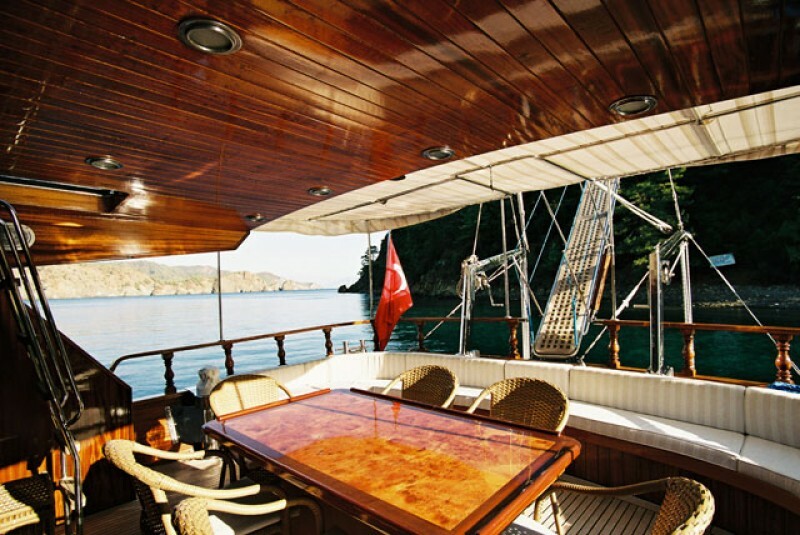 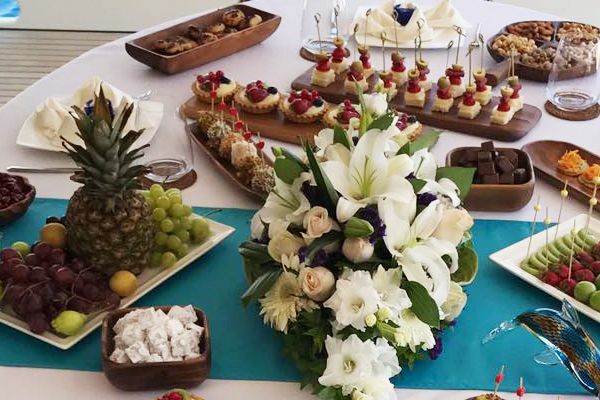 The handpicked crew of Captain, chef and crewman on yacht Serenity 70 maintain the gulet in an impeccable state, while providing a fully professional hospitable and discrete service to the guests, producing exceptional meals. 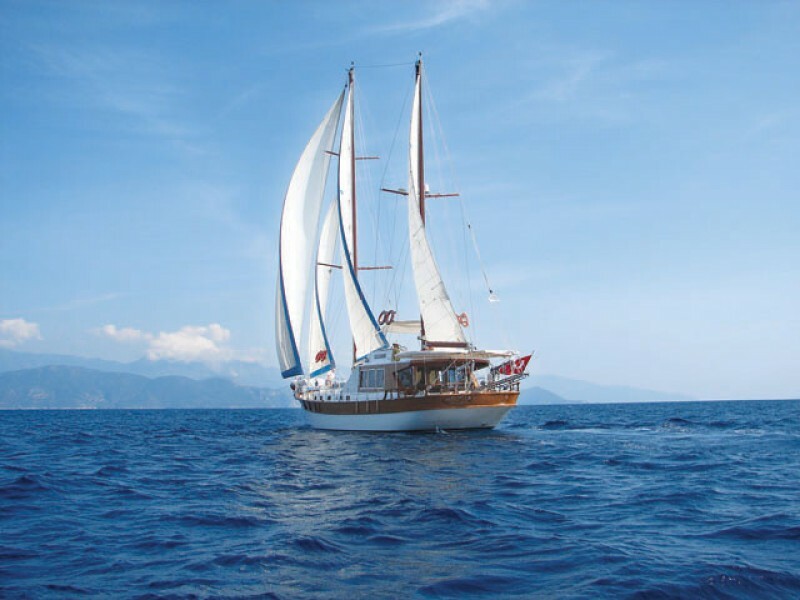 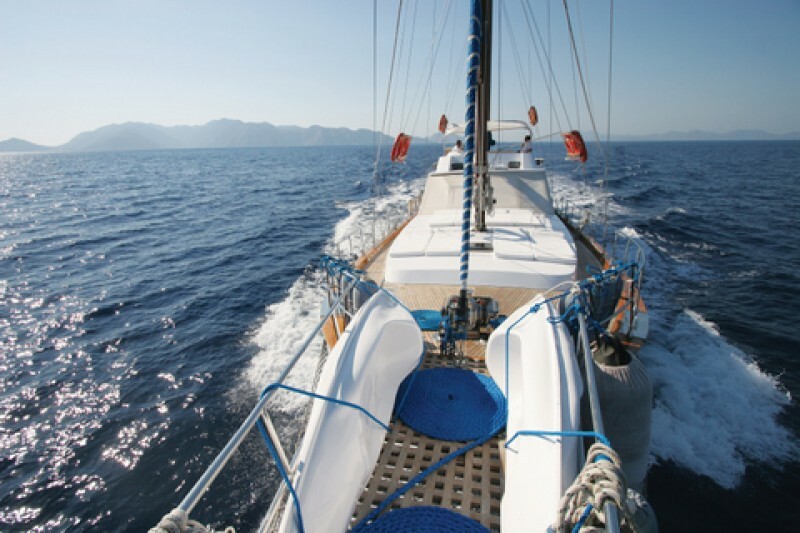 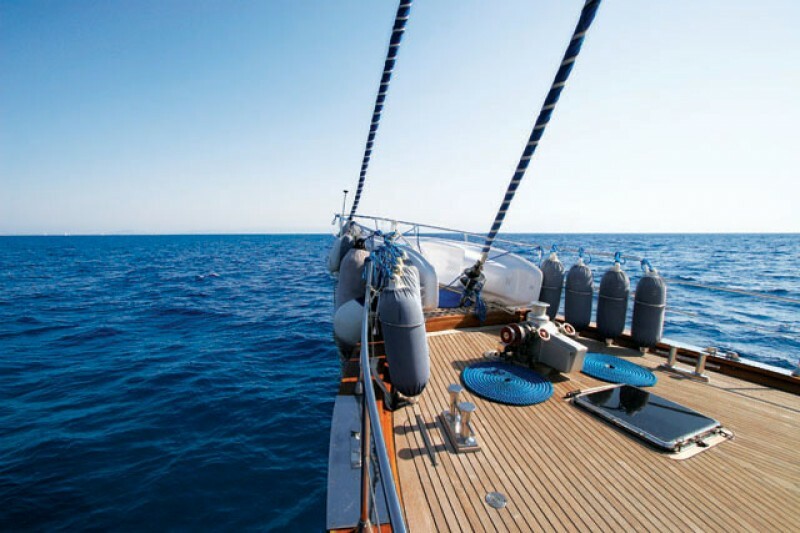 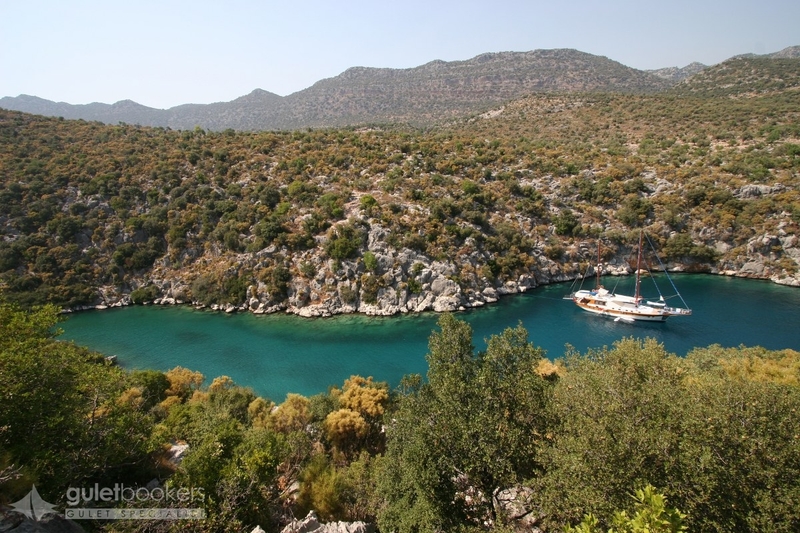 Enjoy experiences on Serenity 70 gulet to make up pleasant memories of a wonderful sailing gulet cruise along the Turkish coast and into nearby Greek Islands.